Brian Burke, President and General Manager of the Toronto Maple Leafs, announced Monday that Scott Gordon and Greg Cronin have been appointed assistant coaches on Ron Wilson’s staff. Burke also disclosed that Keith Acton and Tim Hunter will not return to the team’s coaching staff. 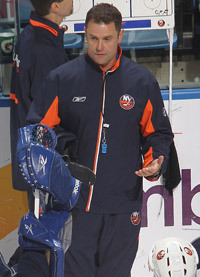 Gordon, 48, is a former head coach of the New York Islanders (2008 to 2010) and the U.S. National Team in 2010 and 2011. He was an assistant coach on Ron Wilson’s silver-medal winning U.S. Olympic Team in 2010. A former goaltender, Gordon’s international resume also includes his participation as a player for his home country in the 1992 Winter Olympics in Albertville, France. Gordon earned the Louis A.R. 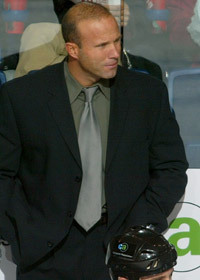 Pieri Memorial Award as the American Hockey League’s ‘Coach of the Year’ in 2007-08 as the Providence Bruins sported a league-best 55-18-3 record. He originally joined Providence as an assistant in 2000 and ascended to the head coach position near the end of the 2002-03 campaign. He fashioned a record of 221-141-20-27 (W-L-T-OT/SOL) in the five seasons running the bench of Providence. Gordon’s coaching career began with the International Hockey League’s (IHL) Atlanta Knights from 1994 to 1996 and another two with that league’s Quebec Rafales. He has the distinction of being the IHL’s youngest head coach in their league’s history when he became the bench boss of the Knights on January 5, 1996 at the age of 32. He is also a former coach of the East Coast Hockey League’s Roanoke Express (1998-99). A native of Easton, Massachusetts, Gordon was a goaltender for Boston College from 1982 to 1986, posting a career mark of 64-35-3. He’s a former Hockey East First-Team All-Star in 1986 and he played a huge role in the Eagles’ first place finish in the ECAC East Region in 1983-84. The Eagles would go on to first-place finishes in 1984-85 and 1985-86. Gordon signed with the Quebec Nordiques in 1986-87. He made his NHL debut in 1989-90 with Quebec and he played a total of 23 NHL games, all with the Nordiques. He retired as a player following the 1993-94 season. Cronin, 48, brings a wealth of professional and collegiate coaching experience to the Blue and White. Most recently, he completed his sixth season as head coach of Northeastern University. He led the team to their first consecutive seasons of posting a .500 record or better since the 1993-94 and 1994-95 seasons. He served as the head coach of the American Hockey League’s (AHL) Bridgeport Tigers from 2003 to 2005, following a five-year stint as assistant coach with the New York Islanders from 1998 to 2003. The native of Boston, Massachusetts was an assistant coach for Team U.S.A.’s entries at the 1997 and 2011 World Hockey Championship. In addition, he served as an assistant coach for two U.S. National Junior Teams (1997, 1998) and earned a silver medal with Team U.S.A. at the 1997 IIHF World Junior Championship. Cronin’s coaching background also includes assistant coaching and interim head coach posts for both the University of Maine and Colorado College. He played four years at Colby College from 1982 to 1986 and he spent the 1987-88 season as an assistant coach at his alma mater. Cronin played an integral role in the institution of U.S.A. Hockey’s National Team Development Program by serving at the helm of the inaugural National Under-18 team in 1997-98.